The Resort Collection Is HERE! I don’t know if I have ever been more excited for a collection of clothing to hit the internet shelves [aside from Gibson x Living in Yellow of course] but the new Gibson x Hi Sugarplum Resort collection that launched TODAY at Nordstrom.com is officially the most vibrant and FUN collection of clothing that is beyond perfect for your next vacation or summer wear! This couldn’t have launched at a better time as we depart next week on our cruise and you better believe I am taking every. single. piece. with me. Whether you are looking for a new dress, some cute tops to wear out or a lightweight pair of shorts or pants, there is something for everybody here! Additionally, this collection was designed as a true capsule so that you can pack only these pieces and be set for your entire vacation [many of which pair well together]! I have a good feeling that by the end of this post, you’ll have a vacation booked just so you have an excuse to purchase and wear all of this goodness. Before we dive in, let’s get the sizing logistics out of the way to make this process easier on you – for reference, I am 5’4, 125 lbs on a good day, typically a 2 in tops/dresses and 26 in jeans/pants with a preferred inseam of 26-28 inches. Bra size is 30DDD [I get it from my momma] Speaking of bras, for this collection you will want to make sure you have a good strapless bra. I can’t recommend this one MORE. It is the only one that has stayed in place and supported my ladies and actually remains comfortable all day long! Hopefully, this helps when determining what size you’d need. Also, feel free to follow along here for daily outfits and check out this Pinterest board where you can also get some ideas! Which reminds me, you can pin any of these looks below to save for future reference! Simply click on the links below and you will be taken directly to the retailer where you can shop! Alright, ladies, let’s dive in! Catalina Ruffle Hem Romper / Fit Tip: True to size, wearing in XS / 3 Colors & Prints! I love that you can dress this romper up with wedges or heels for an event or date night OR pair with sandals and a denim jacket for a more low key evening or day dates. Speaking of wedges, you are going to be seeing a LOT of these guys in this post. They are the only wedge I seem to wear all spring and summer long as they are so comfortable and I love all of the color options! 2. Palm Springs Casual Strappy Maxi Dress / Fit Tip: True to size, wearing in XS / 3 Colors & Prints! It is no secret that I have a thing for a great maxi dress. I always wear them on vacation or summer evenings! The best part? Because this is fully lined, I got away with not having to wear to any bra with it which makes me 100% more times likely to wear it constantly. If it’s cooler, simply pair it with a denim jacket and you’re set! 3. Laguna Soft Jersey Ruffled Racerback Dress / Fit Tip: True to size, wearing in XS / 3 Colors & Prints! Oh my, oh my. This dress is SO SOFT and so comfortable. It’s like wearing pajamas but you actually look adorable and presentable to go out. You could wear this as a swimsuit coverup if you wanted to rock it super casual, or dressed up for dinner or dressed down with sandals. The world is your oyster with this one, I can promise you, you want it. 4. Naples Swing Halter Dress / Fit Tip: Size down if in between, wearing in XS / 5 Colors & Prints! How cute is this swing dress? Also fully lined just like the maxi dress which means yet again, no bra [miracles people, miracles]. I love the tie back and the length [I am wearing in regular length here for 5’4. I could have gotten away with petite most likely but don’t mind it a little longer]! I will absolutely be buying this in more colors! 5. Carmel Tie Back V-Neck Tank / Fit Tip: True to size, wearing in XS / 4 Colors & Prints! I just died and went to tank heaven. I can’t get enough of this tie back halter which is the most flattering hi/low cut with the perfect v-neck [not too low]. The ridiculously cute prints don’t hurt it either. Will you ever see me wearing anything but this tank from now on? WHO KNOWS. 6. Malibu Racerback Embroidered Tank / Fit Tip: True to size, wearing in XS / 3 Colors! Dying over the detail on this one. I love a good party in the back and this tank delivers fully. Now I just need to decide which other colors I want to buy it in [hint: ALL]. 7. Seaside Soft Jersey Easy Lounge Romper / Fit Tip: True to size, wearing in XS / 4 Colors & Prints! Do you remember the material that I was talking about in the ruffle back dress above? Well guess what friends, this romper is made of that same magic. This romper is a great swimsuit coverup option OR a great casual outfit. Extra points because it has pockets! 8. Santa Fe Rickrack Off The Shoulder Top / Fit Tip: True to size, wearing in XS / 4 Colors! Somebody pass me a margarita because I’m ready for a Mexican Fiesta in this cutie! I love the rickrack detail on this and how they made the off the shoulder portion considerably tight so that it shouldn’t ride up much when you wear it! I wasn’t sure what I would think about these pants when I first opened them but now, I think I am hooked. Not only are they super lightweight and airy, they are so comfortable and quite cute. I love how well they pair with these scoop neck tanks which are a perfect staple for all summer long! ps. I got away with wearing a regular bra with these tanks! 10. 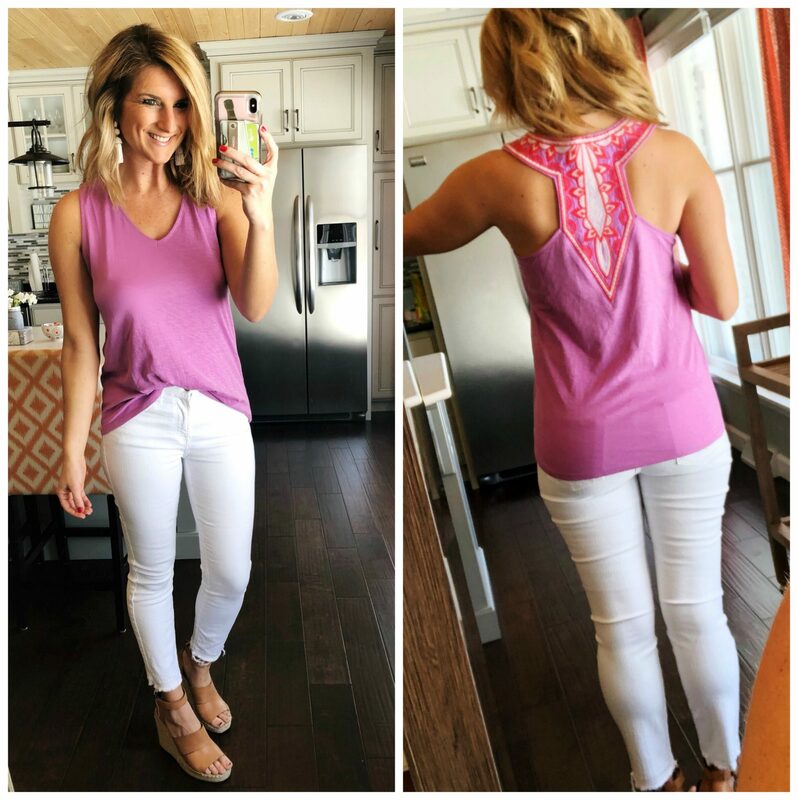 Savannah Embroidered Trim Tee / Fit Tip: Runs large, size down, wearing in XS / 4 Colors! My heart loves embroidered detail and so does my chest. This tee is super comfortable and lightweight and also gives me a little bit of that Mexican fiesta flare. I think it is absolutely adorable! I would recommend sizing down as it does run large. Yellow, you know I can’t live without it. I was stoked to see this tank available in this color. It pairs so well with this blue color that they brought into both styles of bottoms. These drawstring shorts are such a cute take on a lightweight non pair of denim [that look like denim] and are super comfortable as well! Talk about having a Pretty Woman moment with this one. This may just be my favorite item in the whole collection. I think the brown dot print is so fun and really does bring back all of the Julia Roberts vibes. Again with the tank and the drawstring shorts. An effortless comfortable look for a day on the go [or a day at the pool]! 14. Palm Springs Casual Strappy Maxi Dress / Fit Tip: True to size, wearing in XS / 3 Colors & Prints! This is the same maxi that you saw above, just in a different print! Have I mentioned that it has POCKETS? Well surprise, dreams do come true! This is the same romper from above, but I wanted to show it to you in a more dressed up way. While it’s super cute around the pool or at the beach, it’s equally cute for a dinner out [I’m thinking somewhere near the water please] by simply pairing it with wedges instead of sandals! Last but certainly not least, this oversized tunic! As you can see here, I’m wearing it as a swimsuit coverup [I promise that’s not a matching set of bra and undies ;)] but could quickly throw it on with shorts and do a front little tie to dress it up! It’s ultra lightweight and breezy, perfect for days at the beach! There you have it friends! A complete look at the Gibson x Hi Sugarplum Resort collection! It’s hard not to love it all, isn’t it? Congratulations to both my friend Cassie and Gibson for knocking yet another collection out of the park! Make sure to shop it fast as I have a good feeling pieces are going to sell out FAST! Which piece[s] do you love the most? Tell me over on Facebook or Instagram and you may just win a $250 gift card to shop the collection yourself! This is the cutest collection and it all looks great on you! I have a couple of Nordstrom gift cards from Christmas and I am picking up the pants, the tie neck top and that cute dress to wear to our daughter’s graduation events this spring!! Thanks! Those Sedona wide leg pants 👌🏻 I’ll be grabbing those soon! This post is SO helpful because I’m VERY in love with the entire collection and needed some fit intel — thank you so much! Those wide leg pants and all the embroidery are SO fun. Adorable! How do you think the rompers would fit long waisted ladies? I love the look of a romper but can never find the correct fit. Love it all! Perfect timing- just purged my closet! I love the dresses – maxi and the swing halter. Great to have lined options that are still light weight! I love this collection, especially the yellow floral top and the dresses! Everything is so cute! Love the palm print swing dress the best! Love all the fun and bright colors. Can’t wait for warm weather to wear some! What a great collection! Love it all. Seriously need to plan a vacation now. Loving all the yellow. The outfits with the yellow tank are 👏🏻. I LOVE all of it! The festival palm print maxi is definitely a fav! I’m having a baby in May so these loose dresses will be great for post-baby. Thanks for posting, how cute is this all! I have a vacation coming up in March & one in April and I just ordered the Palm Springs Casual Strappy Maxi Dress!! Definitely my fave from the collection, but I also might need the Laguna Soft Jersey Ruffled Racerback Dress too! Loving the maxi dresses and the romper. Too bad we just got back from a cruise. I need another vacation!! super cute prints and I love the vibrant colors! I love ❤️ all of these pieces!!! My family and I are going on our first cruise in July and these outfits would be perfect!!! If I absolutely had to choose one I would pick the romper because it can be dressed up for night or more casual for day! Plus I have 3 year old twins so anything comfortable for running after them is perfect in my book!!! I am 5’7…is the Palm Springs maxi short? It looks great on you but on the webpage looks short. Love the brown polka-dot tank! Awesome overall collection of summer style. Most of these items I would wear except for the maxi dresses. Maxi dresses without a large slit to show off my legs & stylish sandals are grandma dresses. Getting tired of the same ugly black jacket, sweaters, jeans, sneakers winter look. Enjoy your cruise. At least you escape winter for a while. Love this collection! Loving the Palm Springs Strappy Maxi!! That naples swing halter dress is sooooo cute!!! Absolutely love the print! In love with the soft jersey romper! I love both of the rompers!! The maxi dress! Love the colors in this collection! Love outfit number 7! So cute! Love them all actually! I love the Palm springs casual maxi dress. I love the brilliant blue ruffle sleeve dress and the linen, wide leg pants! The embroidered yoke top works too! Love everything! I want it all! :). Everything is gorgeous and so versatile! Please let us know when everything is restocked. I missed the launch! Please tell me that they will be restocking! I’m so bummed I missed the scoop neck tank and the racer back embroidered tank. Finally got a minute to order some items and everything in a small is sold out 😖 Any idea when/if items are being restocked? Love the summerland scoop neck pocket tank top! That color is amazing!